MD and CEO of mjunction, Viresh Oberoi, on managing to make time for his favourite sports-golf and squash. 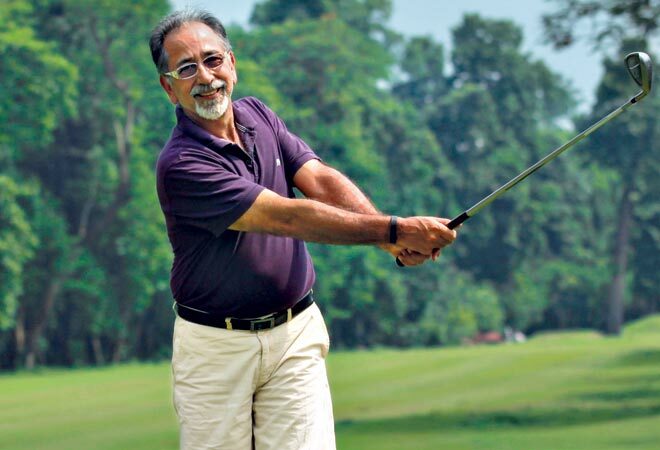 For Viresh Oberoi, MD and CEO of mjunction, a venture promoted by SAIL and Tata Steel, golf is a late love but a cherished one. His weekends are incomplete without a few hours spent on the green. He's also an avid squash fan. He gives the lowdown on playing golf in Kolkata in scorching weather and still loving it. Admittedly, I'm able to make time for golf only on the weekend. That too just one day in a week, so it's a challenge just retaining my handicap. However, I don't make an exception to this habit even when the mercury touches 40 degree Celcius and humidity crosses 90 per cent. Apart from golf, I used to be keen on tennis. Now I prefer squash because 40 minutes on the squash court is enough exercise for a day. For me, it pans out into squash on Saturday and golf on Sunday. Two days a week, I hit the gym and two other days it's a round of power walking. On my first job with Tata Steel in Kolkata, I was transferred to branches and regional offices across the country. In the eight cities that I covered before I returned to Kolkata I played tennis and vowed that when I got back to Kolkata I would take up golf at the Tollygunge Club. I stuck to my guns when I returned and I hit the driving range at Tollygunge Club. I have a TaylorMade golf set with a Calloway Driver. The clubs have a regular shaft and they suit me well. When I started playing, I bought a used set from a national champion-a Golden Ram Stiff Shaft Steel set. Then I hadn't realised that you need to be a single handicapper if not scratch player to use such a specialised golf set. It was many years later when I approached a golf trainer to check out my swing that I wisened up to such nuances. He suggested that I needed a new golf set and not golfing lessons. I had to pay him Rs 1000 for the golfing advice though. On the par-4 and par-5, I normally tee off with my Calloway Driver and then use the Irons. Short of par-3 it's usually the 6 or 7 Iron, which gets me on the green. I quite enjoy chip shots. Unfortunately, I am yet to get a hole in one. I am quite happy to make the green with my drive on a par-3. I also putt in for a par and at times a birdie. Though I have played on a number of golf courses both in India and overseas, the most memorable experience has to be the two rounds that I played at the Royal Melbourne Golf Course in 2011. I had won the Economic Times Leaders Challenge Tour held in Kolkata and therefore, was selected to play the National finals held in Australia. It was awfully chilly and I had to get used to wearing a thick jacket while playing golf. Additionally, I had to remember to pull my golf cart as there were no caddies and it was a walking course. It was a great experience and I look forward to doing it some time again. In my home club, I'm among the top three players. Squash is the sort of game that gets you really pumped up and it brings forth my natural competetiveness. With regard to shots, I can pull off most shots but I try and play in response to my opponent's weakness. In my games, I use the double yellow dot ball and play in singles. Now, I play at Tollygunge Club in Kolkata but I learnt the game at Delhi Gymkhana Club. My work requires me to travel overseas frequently. I find that one of the best ways of learning is by exchanging ideas. On my last international trip, after spending five days in Las Vegas at a technology conference, I hired a car and drove to Silicon Valley on Highway 1. It is one of the most scenic routes for driving, more so because it passes through the panoramic Pebble Beach. I remember spending a night many years ago with a French couple in their home in Lille. They spoke only French and we spoke only English but we got on famously, drinking wine, eating fondue and dancing the bhangra to French music.